A vintage Bell Moto 3 helmet sits on the bookshelf in Josh Leder’s office next to his father’s collection of antique cameras. In a remodeled historic carriage house, the 41-year-old real estate developer manages a portfolio of properties in his adopted hometown of Brevard, N.C. The office looks more like a designer man cave than the headquarters of one of the area’s major real estate moguls. Unlike what you’d expect to find in this office park just off the four-lane, Leder’s workplace features exposed beams, natural materials and high-tech smart-home fixtures controlled from a tablet that currently fills the place with ‘80s classic rock and allows you to watch the traffic outside while using the bathroom. Downstairs a small fleet of motorcycles and a classic Jeep CJ-7 fill the garage instead of a businessman’s ubiquitous sedan or SUV. Just as his office is not what one would expect, neither is the man. While other developers in nearby cities are building 500-unit apartment blocks, big-box stores or strip malls, Leder cares more about building and maintaining a community than simply maximizing profits. He lives here. His kids go to school here, he explains. He saves extinct wood and greasy spoon diners much for the same reason. They’re a part of the community and deserve a new purpose. With his youthful looks, a touch of gray at his temples and an unassuming manner, the Florida native never comes across as an outsider trying to profit off the former factory town. Instead, he speaks fondly of his childhood vacations spend in the area. As a youth, his father worked at a summer camp here and later instilled in his children a love for the region. Some of Leder’s projects include the Brevard Lumberyard, which now serves as the town’s arts district hosting a bike shop, bar, restaurant and event center. Squatch Bikes and Brews exemplifies a growing trend in Brevard – outdoor sports and craft beer. “We now have bicycle shops all over the place where five years ago, we didn’t. and we have breweries all over the place where we didn’t. You are starting to see motorcycling taking its place alongside these others,” Leder said. Leder also purchased the bankrupt Glen Cannon Country Club, along with its stunning waterfall, and hopes to turn it into a resort or spa someday. Meanwhile, he lets community members use the swimming pool and former golf course as a park. “We ride dirt bikes on the fairways. In winter, we sled down the hills,” Leder says as his Land Rover bounces over an abandoned tee box. 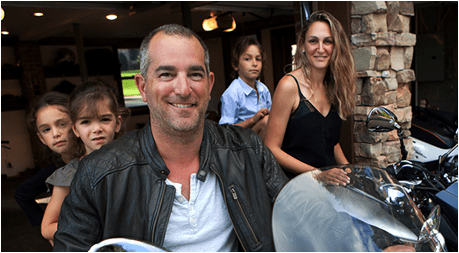 So, how does a man with a wife, three children and a multi-million-dollar business find time to ride motorcycles? The door rolls up to reveal a naked streetfighter Suzuki B-King, a Honda Rune 1800 cruiser, a BMW G650X and a Honda XR dirt bike. Leder grabs a perfectly distressed leather jacket with café racer stripes down the front and selects the dual-sport BMW for today’s outing. “Meditation and yoga are popular for many people. For me, I can slow down by going fast,” he says with a grin. Just bordering the Brevard city limits lies Pisgah National Forest. This half-a-million-acre park offers outdoor recreation enthusiasts an endless assortment of opportunities, including hiking, rock climbing, fishing and bicycling. For motorcyclists, it’s a green heaven. 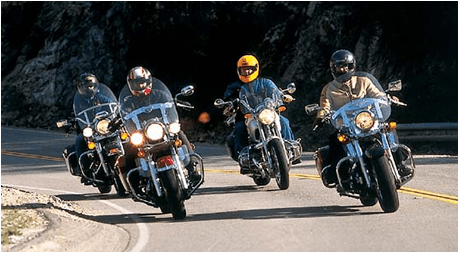 Gentle riverside curves, challenging uphill switchbacks, stunning roadside waterfalls and gravel Forest Service roads all cluster together giving cruisers, sport-bike and dual-sport riders whatever they desire. Leder’s BMW seems to know all the curves like a trained hunting dog. Brevard, population 7,600, once relied on manufacturing for its livelihood. With major employers like Ecusta Paper and DuPont long gone, the region now turns to its natural wonders to attract businesses, residents and two-wheeled enthusiasts of every type. National Forest, but riding down the Blue Ridge Escarpment to the south and the stunning vistas from Caesar’s Head State Park across the South Carolina line. “I like the fact Brevard is a little bit secluded. It kind of stands on its own. It’s got a good small-town feel. The amount of outdoor recreation tied to the town is really second-to-none,” said Matty of Squatch Bikes and Brews as his expertly assembled a rear hub on a new mountain bike. And the popularity of craft beer sweeping the region only adds to Brevard’s appeal. Sam Salman, Leder’s friend and neighbor, operates The Hub and Pisgah Tavern with his wife, Jordan. 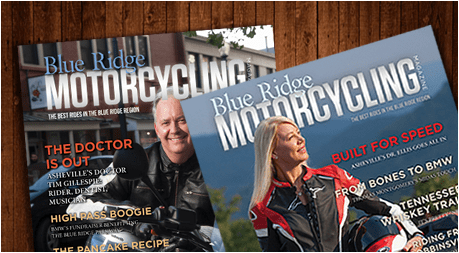 Located at the entrance to the Pisgah National Forest, the full-service bike shop also offers recreation enthusiasts a barstool and cold craft brew for both types of two-wheeled travelers. A Brevard-area resident for 15 years, Salman rides a BMW GS800 adventure bike when he’s not pedaling a mountain bike. He usually prefers riding in the dirt in Pisgah and nearby Nantahala National Forest. 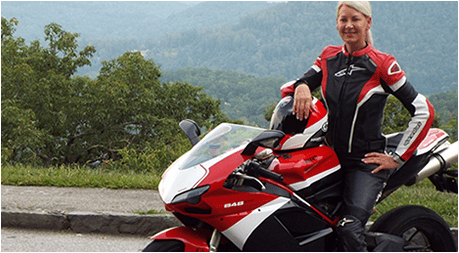 “I guess motorcycle-wise, the best thing about the area is probably got to be the twisties and the views. And we definitely have a the high quantity and quantity of dirt and gravel roads – Forest Service roads – that are really fun for the dual-sporters. Mountain bike-wise, we have an unparalleled amount of single-track. Such a dense and diverse amount of trails, definitely more than anywhere else on the East Coast,” he said. His bike shop and tavern fills with both spandex- and leather-clad riders on the weekends during the summer. The Pisgah Tavern is the last stop if you want a craft beer before U.S. 276 climbs over the Balsam Mountains and into Canton in Haywood County 25 scenic and wonderful miles away. “We love all things two wheels. We’re more of a craft-beer bar. People stop in and say, “What, no Bud Light?” he chuckled. While Brevard may lack a rowdy, traditional “biker bar,” many see this new trend of bike-shop pubs as an attractive new economic engine for the region, capitalizing on the thousands of visitors each year seeking out Brevard’s abundant opportunities for outdoor recreation. “Bikes and beer have always gone together: before, after, during. It’s just one of those awesome connections. Most breweries, too, are into the cycling scene. I think it comes down to the outdoor lifestyle,” Salman said. For developer Leder, the great outdoors just makes sense as one of the best ways for Brevard to build a more sustainable future. Take what’s already there and give it a new purpose, much like what he has done with most of his projects. “It is interesting that mountain biking and beer blended into a new brand. It’s kind of like peanut butter and jelly,” Leder said.